I’ve been into sports since I was 5 and played on my first tee ball team. My passion for baseball grew over the years and I continued to play all the way through high school. During high school I also played football and wrestled. After high school I wanted to continue playing ball so I signed up for some recreational slow pitch softball but that wasn’t the same level I was used to and nowhere near the workouts my body had grown accustomed to. I went right from high school into a job that paid pretty well and started taking night classes at the community college. During this time I gained a lot of weight and it wasn’t until a couple years later that I first tried to address the problem. I found some “diet” to follow and had some success and got back to where I was comfortable and no shock to anyone I went back to eating garbage and no exercise so my weight went right back up. Over the next 15 years I was on a roller coaster with my weight. I’d lose 60 and gain 80 before panicking and jumping on another diet of some sort. Basically if there was a fad diet, super pill, or magic powder I tried it and each time I had some success but never anything sustainable. The end of December 2010 I found an ad in The Pantagraph for a local martial arts class and figured maybe I should try this. 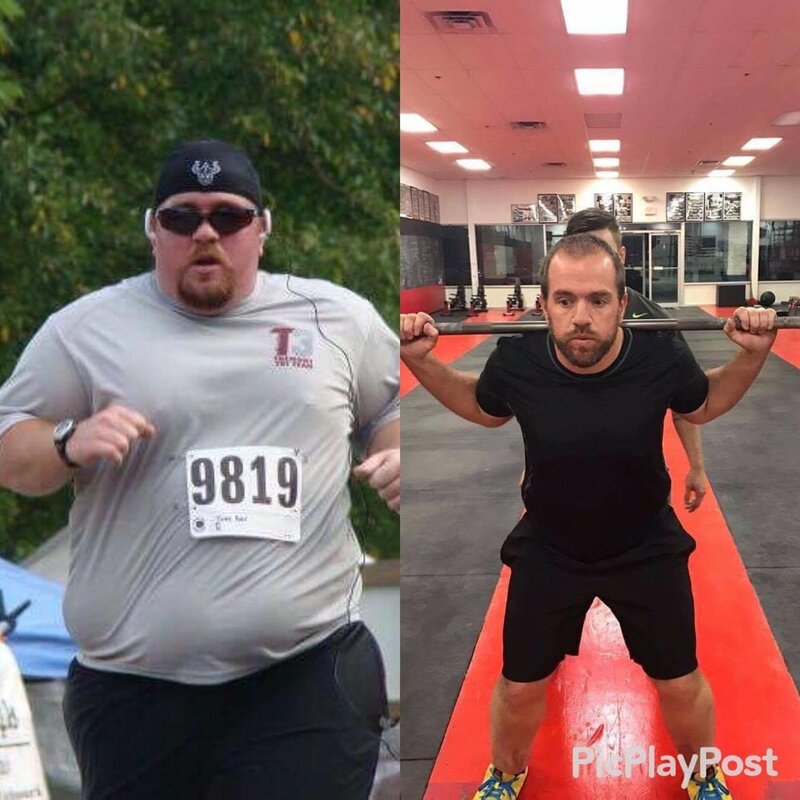 So I sent an email to the instructor asking a few questions and he sent back some basic stuff but the last line will stick with me forever, “come join us to start the first day of the rest of your life.” January 4th I showed up at class close to 400lbs in a pair of track pants and a t-shirt with no idea what to expect. What I found was an instructor who never let me get away with an I can’t answer. If I tried and could not execute what I was asked he would scale it so I could have some success. Over the next 3-4 months I gained back my confidence. I started making small changes to what I ate and drank and adding in some cardio just long walks with a little jogging. One of the guys in the class knew I had been working on my cardio and asked me to join his triathlon relay team for the Tremont Triathlon. Well I couldn’t say no because it’s my hometown. When all was said and done I was going to be doing the bike portion and was pretty scared. I had no idea if I could ride 13 miles. I had a used road bike, mountain bike shoes, a hydration pack, and an Under Armour shirt stretched to its max. I finished that bike ride and all of the fans were cheering like crazy for me. I was hooked after that. I took up training for Tri the Illini which would be held in September 2010. I continued to change my eating and add in more exercise and started to lose even more weight. I got to the race and finished in just over 2 hours which is a long time for a sprint distance but heck I finished and I wasn’t last. I knew I had found what I was looking for with triathlon and my current triathlon club T3. The next 5+ years I kept after it continuing to change my diet and increase my exercise. I learned a lot about myself, my body, and what I was capable of during this time. I also knew I had a new goal. I was going to take on an Ironman race. For those that don’t know and Ironman is a 2.4 mile swim, 112 mile bike, and 26.2 mile run all done back to back. I went to Madison to watch Ironman Wisconsin in September of 2014 and was completely in awe of these athletes. Monday after the race I signed up to compete in 2015. I worked hard and was scared to death about what I had signed up for. Someone from Ironman called me Tuesday of race week and asked if I would be ok being interviewed as one of the feature athletes at the athlete banquet. This was way out of my comfort zone but decided that by letting them interview me I might be able to help someone else get off the couch and change their life. I showed up for race day having lost about 120lbs and ready to go. The race was amazing and I finished in 16:20 and it was one of the best days of my life. I knew after that I’d be back for more because it was such an amazing experience. But I also knew I needed to refocus on my weight because I still was not where I wanted to be. I had hit a plateau pretty hard and was stuck. A friend of mine told me about a gym she was working out at and I decided to give it a try. I went in and talked to Drew at Be Strong and discussed my goals a little. He had me come back a few days later to get started with a fit test. I was sure I was going to die after that test but I kept going back 3 times per week. Now about 4 months in I blew through that weight loss plateau and am down a total of over 150lbs and stronger than I’ve been in a long time. I’ve found another group of athletes that push each other to give their best every day and support each other during those days when you just don’t have it. A big thanks to Drew, the coaching staff and all my fellow athletes.